The IAFE began in 1885 with a half dozen fairs. Today, the IAFE represents more than 1,100 fairs around the world, and more than 900 members from allied fields. Throughout the years, the IAFE has remained true to its purpose of promoting and encouraging the development and improvement of agricultural fairs, shows, and expositions. What is a fair? According to the dictionary, a fair is a competitive exhibition (as of farm products), usually with accompanying entertainment and amusements. Have you been to a fair recently? Think about all the things you saw. You probably observed the usual entertainment food, such as cotton candy. There might have been a few of the traditional rides, like the ferris wheel. 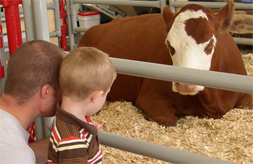 But the key difference between a fair and a festival or carnival is the fact that a fair has several contests involving farm animals or produce; you will always see various animals or the best-grown vegetables at a fair. The IAFE is governed by a board of directors that consists of 18 elected members and the president and CEO selected by the board as an ex-officio director. The directors include a chair, two immediate past chairs, two vice chairs, a treasurer, a representative of the Federation of State and Provincial Associations of Fairs, a representative of the Canadian Association of Fairs and Exhibitions, eight directors elected from and representing each of the eight zones in the United States and Canada, and two directors at large from associate members.